Walking from one historic site to another is what many tourists enjoy doing whenever they visit a new country. The exploration and discovery of historically significant places enhances one’s understanding of a place’s past, heritage, culture and people. Since 1999, the National Heritage Board (NHB) has researched on and developed a series of heritage trails in our heartlands that aims to bring heritage closer to the public, and help residents understand and appreciate the place in which they live, study, work and play in. These heritage trails range from heartland areas such as Toa Payoh, Yishun and Bedok to well-known heritage estates such as Balestier, Kampong Glam and Little India. In 2013, NHB piloted the Heritage Trail Adoption Scheme with Henderson Secondary School. 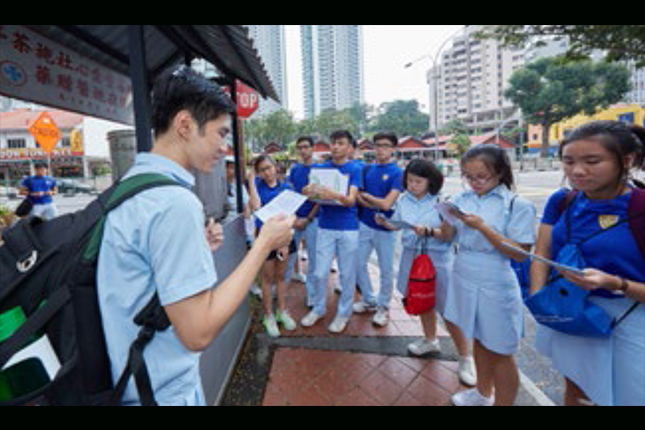 The then newly launched Tiong Bahru Heritage Trail was adopted by the school and 12 pupils were trained by NHB to be student guides. These student guides would later go on to guide the VIP entourage during the trail’s launch. CJC student sharing with his peers about the former Shaw Malay Film Studios. Courtesy of National Heritage Board. To promote the use of existing heritage trails and to document the social memories of the estate that we live in, the Heritage Trail Adoption Scheme gives schools the platform to adopt either an NHB heritage trail or a school developed trail for a period of three years. Schools participating in the scheme may choose to undertake the guiding training programme for students or the how-to-teach-guiding training programme designed especially for teachers. 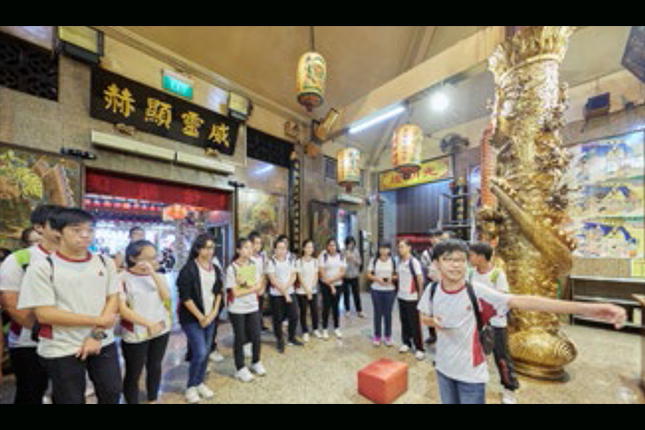 The programme also encourages schools to teach heritage in a fun and meaningful way by using the trail for orientation or camp programmes, and to integrate cross-subject learning elements to ensure that the young appreciate the continued relevance of heritage. CJC student sharing with his classmates about the water kiosk situated at the corner of Boon Teck Road. Since the programme’s launch up to 2017, more than 25 schools have adopted either an NHB Heritage Trail or a school developed trail, and more than 600 students and 30 teachers have been trained under the programme. Today, the scheme is a robust one with a good spread of participation from primary schools, secondary schools and even tertiary institutions. 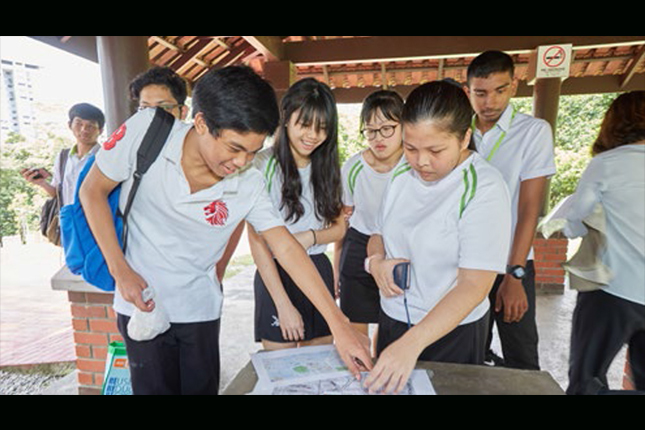 Students from ITE College Central experiencing a fun-filled heritage trail about Ang Mo Kio Heritage Trail. Suitable for all ages and student profiles, this scheme has benefited both high-potential and average students by equipping them with life skills that go beyond heritage knowledge. The scheme’s flexibility to be integrated into curriculum has also brought out teachers’ creativity in designing heritage trails that engage students through meaningful exploration and discovery of heritage. A student from Manjusri Secondary sharing with his/her peers about the religious site along the school-developed Interfaith Heritage Trail. Download a step-by step guide on how to develop a heritage trail here. For more information or to sign up for the programme, please email our Education team at NHB_educationprogrammes@nhb.gov.sg.